I had fresh corn for the first time this week. Heaven. I live for fresh corn. I can’t get enough of it. I gorge on it all summer, and then suddenly, just as the air grows chillier and the corn kernels harden, I find I can’t stand one more ear. I’m ready for turnips and cauliflower. 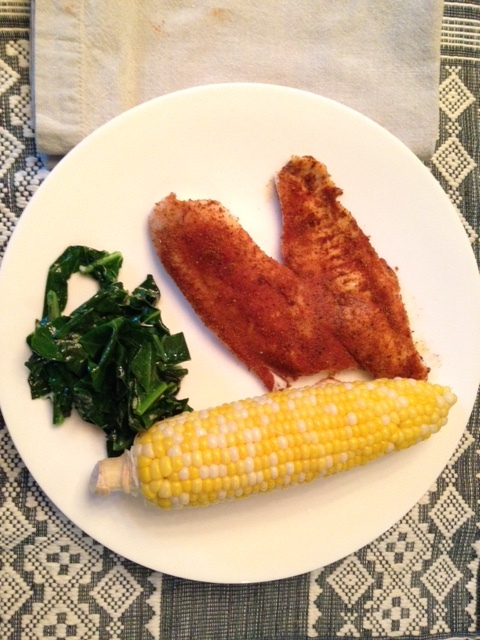 I haven’t posted a recipe in a while–just haven’t been inspired in recent months–but the arrival of corn at my local markets has gotten me fired up to share this incredibly easy, fast and delicious tilapia recipe, served with steamed corn and collard greens stir-fried with garlic and olive oil. 2. Prepare the spice mixture, combining all the ingredients in a small bowl. 3. Coat pan with Pam spray. 4. Spread fillets with the spice mixture on both sides. Spray top of then fish with Pam. 5. Bake for 1-12 minutes, until the fish flakes. 6. Serve immediately, garnished with lime halves. I have to share this recipe, too, because it’s the dessert equivalent of the Tilapia dish–no, it’s even easier you don’t have to worry about whether you have Old Bay seasoning or if you remembered to buy dried mustard. As long as you have a pint or two of blueberries around, or a few fresh plums–both so plentiful in the summer–you can make this last minute. It’s so easy you won’t believe it actually tastes good. The fruit melts into a crusty, buttery cake. It’s even better for breakfast the next day. My friend Ellen Newman, a Cobble Hill, Brooklyn, neighbor, is the genius behind it. A couple of plums, peeled and sliced; or two pints of raspberries; or one-two pints of blueberries. You’re wondering about milk, aren’t you? Nope. There’s no milk involved. No other liquid–just go with it! 2. Mix together everything but the fruit in a greased and floured springform pan. 3. Gently put fruit on top. 4. Bake for 45 minutes to an hour, until the top is golden. Write me if you try this. I need to know that despite your reservations about how this could possibly turn out, it did, and you were thrilled. Inspiration from Rafa Nadal: Fight! I’ve been glued to the French Open this week. ESPN and Tennis Channel make watching live tennis from around the globe just so easy. Too easy. And I’m so weak! I could’ve taped matches and watched them after writing hours. Of course I could have. And I clearly have to develop some discipline before Wimbledon begins in a month. I admire the red clay and the gritty play of Paris, but I love the elegance of grass courts and players all in white (and it is kind of fun when the camera finds a royal or two). I remember the days when Roger Federer ruled the grass, and he’d appear on Centre Court in a crisply tailored white jacket that he wore solely for that walk to his chair before his match. Yesterday, with my computer in front of me, patiently waiting for my attention, I turned on the Rafa-Djokovic French Open quarter final. There wasn’t much to watch, sadly. Rafa Nadal, the King of Clay, who has won a record nine French Open titles, was trounced in straight sets. Shocked? Yes. Surprised? No. Most commenters had been expecting Djokovic to win. Nadal has struggled in recent months. He didn’t win even one of the clay-court tournaments that he usually dominates and has dominated for nearly a decade. Then again, he’s got good reasons for not being at his best. He had an appendectomy at the end of last year, and has been dealing with back, wrist and knee issues. Some commenters have already declared him past his prime. They aren’t saying his career is finished, but coming awfully close. It seems to me that anyone who’s watched Rafa for any length of time would know that he is nowhere close to retiring. He just took the biggest beating of his career (arguably), and what does he take from it? I am going to fight. This from a man who’s already in the history books as one of the best of all time. He’s won 14 Gram Slams, tied for second place with Pete Sampras (behind Federer, who’s won 17). It’s incredible that he still has the fire to achieve even more. Nadal is my inspiration this week. You have to work hard and harder and fight for what you want.